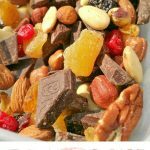 This Trail Mix with nuts, fruits, and dark chocolate is simple, delicious and keeps you energized, perfect for snacking! I used about 1/4 - 1/2 cup of each ingredient. Store them in a jar or airtight container.